ROS are important intracellular messengers; their ambiguous role in malignant processes was demonstrated in many studies. 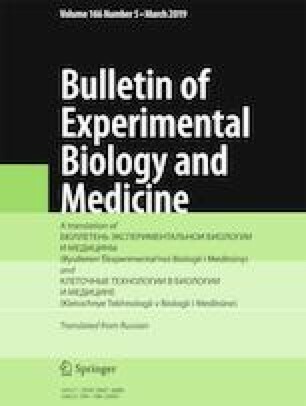 The effects of a synthetic phenolic antioxidant sodium 3-(3’-tert-butyl-4’-hydroxyphenyl)propyl thiosulfonate sodium (TS-13) on the tumor growth and oncolytic properties of doxorubicin were studied in the experimental model of Lewis lung carcinoma in mice. In mice receiving TS-13 with drinking water (100 mg/kg), suppression of tumor growth by 32.3% was observed on day 21 after inoculation of Lewis lung carcinoma cells. Two-fold intraperitoneal injections of doxorubicin in a cumulative dose of 8 mg/kg were followed by inhibition of tumor growth by 49.5%. Combined treatment with TS-13 and doxorubicin suppressed the tumor growth by 55.4%. In contrast to doxorubicin, TS-13 inhibited NO generation by peritoneal macrophages. The results show the prospect of studying TS-13 in the context of overcoming drug-resistance of tumors. Kumari S, Badana AK, Gavara MM, Gugavalath S, Malla R. Reactive oxygen species: a key constituent in cancer survival. Biomark. Insights. 2018;13. ID 1177271918755391. doi: https://doi.org/10.1177/1177271918755391.